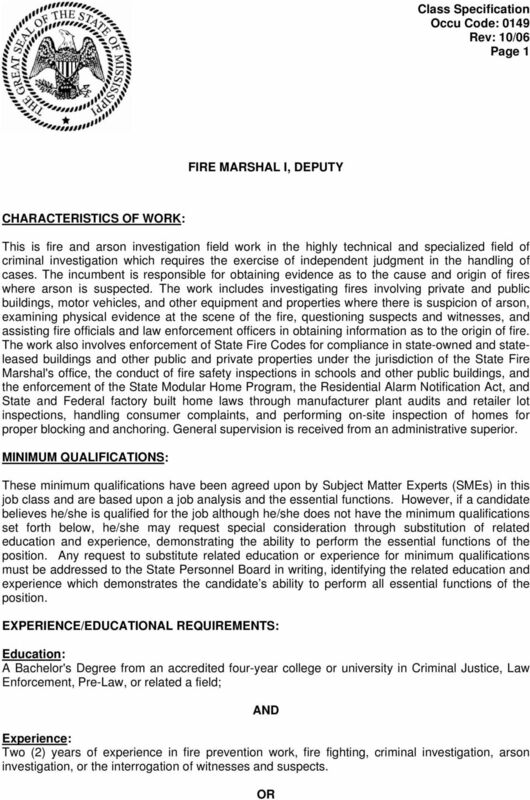 Download "FIRE MARSHAL I, DEPUTY"
2 Page 2 Education: Graduation from a standard four-year high school or equivalent (GED); AND Experience: Six (6) years of experience in work related to the described duties, two (2) years of which must have been in fire prevention work, fire fighting, criminal investigation, arson investigation, or the interrogation of witnesses and suspects. Substitution Statement: Related education and related experience may be substituted on an equal basis, except there shall be no substitution for two (2) years of experience in fire prevention work, fire fighting, criminal investigation, arson investigation, or the interrogation of witnesses and suspects. Possession of a current State of Mississippi Law Enforcement Professional Certificate or State of Mississippi Fire Academy Fire Inspector I & II (NFPA 1031) Certificate may be substituted for one (1) year of required experience. * Special Requirements: Employment in State Fire Marshall's Office shall be contingent upon successful completion of the established training program conducted by the Board of Law Enforcement Officers Standards and Training for this class or the established training program conducted by the Mississippi State Fire Academy and certified by the Mississippi Fire Personnel Minimum Standards and Certification Board within one (1) year of employment. Applicants will be required to pass a physical examination before appointment at the applicant s expense. Applicants must not have been convicted by any state or by the federal government of any crimes, the punishment for which could have been imprisonment in the federal or state prison or institution; nor have been convicted of sufficient misdemeanors to establish a pattern of disrespect for the law. Documentation Required: Transcript to verify required course work, when applicable. 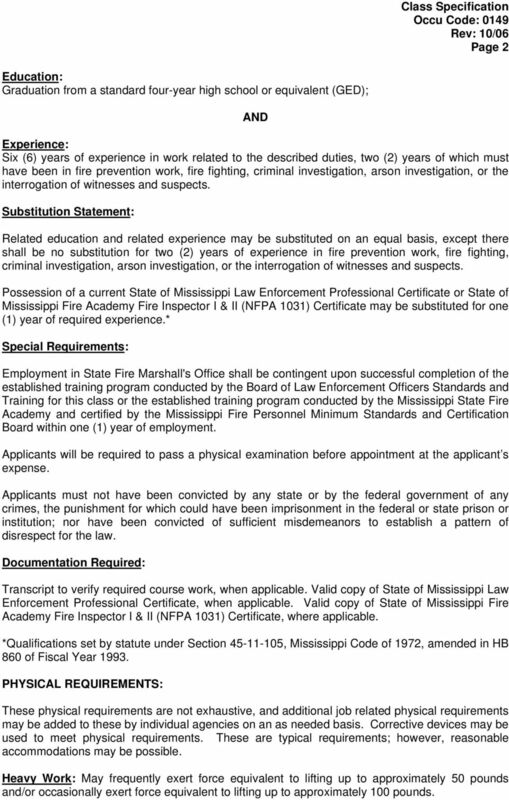 Valid copy of State of Mississippi Law Enforcement Professional Certificate, when applicable. Valid copy of State of Mississippi Fire Academy Fire Inspector I & II (NFPA 1031) Certificate, where applicable. *Qualifications set by statute under Section , Mississippi Code of 1972, amended in HB 860 of Fiscal Year PHYSICAL REQUIREMENTS: These physical requirements are not exhaustive, and additional job related physical requirements may be added to these by individual agencies on an as needed basis. Corrective devices may be used to meet physical requirements. These are typical requirements; however, reasonable accommodations may be possible. Heavy Work: May frequently exert force equivalent to lifting up to approximately 50 pounds and/or occasionally exert force equivalent to lifting up to approximately 100 pounds. 3 Page 3 Vision: Requires the ability to perceive the nature of objects by the eye. Near Acuity: Clarity of vision at 20 inches or less. Midrange: Clarity of vision at distances of more than 20 inches and less than 20 feet. Far Acuity: Clarity of vision at 20 feet or more. Peripheral: Ability to observe an area that can be seen up and down or left and right while eyes are fixed on a given point. Depth Perception: Three-dimensional vision. Ability to judge distances and spatial relationships so as to see objects where and as they actually are. Ability to adjust focus: Ability to adjust the eye to bring an object into sharp focus. Color Vision: Ability to identify colors. Speaking/Hearing: Possesses the ability to give and receive information through speaking and listening skills. Taste/Smell: Possesses the ability to use the sense of smell to recognize and distinguish odors. Possesses the ability to use the sense of taste to recognize and distinguish flavors. Motor Coordination: While performing the duties of this job, the incumbent is regularly required to stand; use hands to finger, handle, or feel objects, tools, or controls; and reach with hands and arms. The incumbent is frequently required to sit; walk; stoop, kneel, crouch, or bend; and climb or balance. 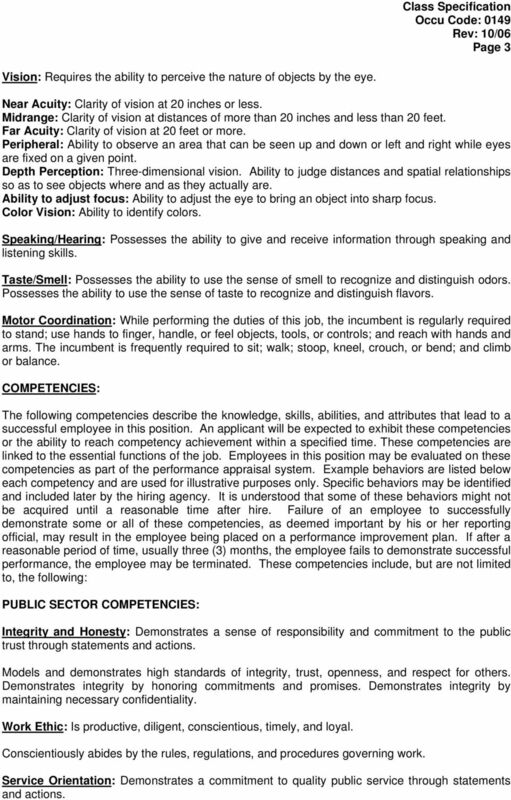 COMPETENCIES: The following competencies describe the knowledge, skills, abilities, and attributes that lead to a successful employee in this position. An applicant will be expected to exhibit these competencies or the ability to reach competency achievement within a specified time. 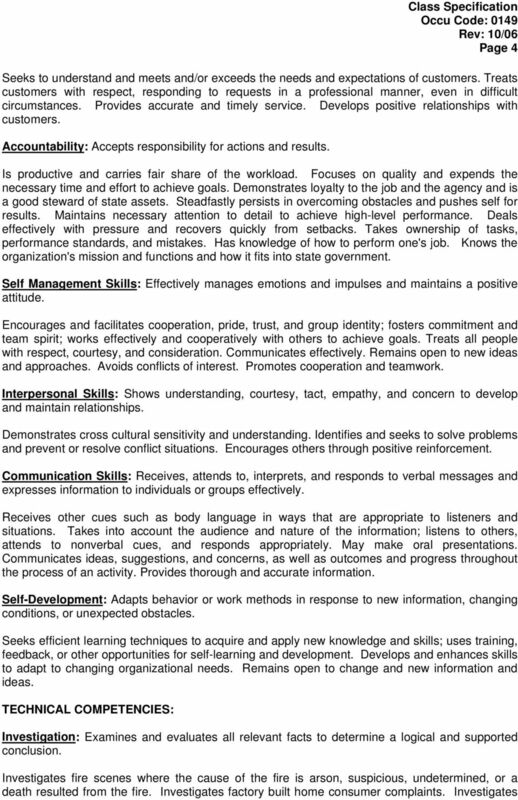 These competencies are linked to the essential functions of the job. Employees in this position may be evaluated on these competencies as part of the performance appraisal system. Example behaviors are listed below each competency and are used for illustrative purposes only. Specific behaviors may be identified and included later by the hiring agency. It is understood that some of these behaviors might not be acquired until a reasonable time after hire. Failure of an employee to successfully demonstrate some or all of these competencies, as deemed important by his or her reporting official, may result in the employee being placed on a performance improvement plan. If after a reasonable period of time, usually three (3) months, the employee fails to demonstrate successful performance, the employee may be terminated. These competencies include, but are not limited to, the following: PUBLIC SECTOR COMPETENCIES: Integrity and Honesty: Demonstrates a sense of responsibility and commitment to the public trust through statements and actions. Models and demonstrates high standards of integrity, trust, openness, and respect for others. Demonstrates integrity by honoring commitments and promises. Demonstrates integrity by maintaining necessary confidentiality. Work Ethic: Is productive, diligent, conscientious, timely, and loyal. Conscientiously abides by the rules, regulations, and procedures governing work. Service Orientation: Demonstrates a commitment to quality public service through statements and actions. 5 Page 5 fires involving private and public buildings, motor vehicles, and other equipment and properties. Conducts a thorough analysis of the facts. Compliance: Ensures compliance with applicable state and national fire safety/protection codes and laws. Enforces State Fire Codes for compliance in state-owned and state-leased buildings and other public and private properties under the jurisdiction of the State Fire Marshal s Office. Enforces State and Federal factory built home laws through manufacturer plant audits and retailer lot inspections. Information Management: Identifies a need for and knows where or how to gather information. Obtains evidence as to the cause and origin of fires where arson is suspected. Questions suspects and witnesses. Interrogates suspects when the crime of arson is confirmed. Assists others in obtaining information as to the origin of fire. Collects and preserves evidence. Report writing and Record Keeping: Maintains adequate records and files on investigative findings. Prepares comprehensive investigative reports which detail the facts and circumstances of a case for use by local authorities. Prepares and maintains field files. Submits reports on time. Uses correct spelling and grammar. ESSENTIAL FUNCTIONS: Additional essential functions may be identified and included by the hiring agency. The essential functions include, but are not limited to, the following: 1. Conducts inspections of state and/or privately owned buildings and properties to ensure compliance with state and national fire safety/protection codes. 2. 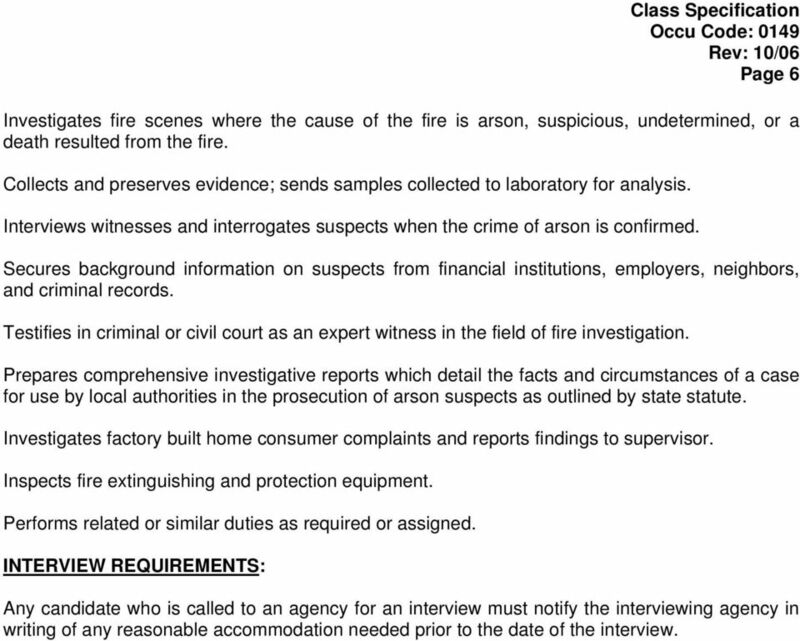 Conducts fire and arson investigations, which includes preparing related reports and maintaining related files. 3. Provides training and related information to new and existing staff members. 4. Conducts inspections of factory built homes to ensure compliance with state and federal regulations. 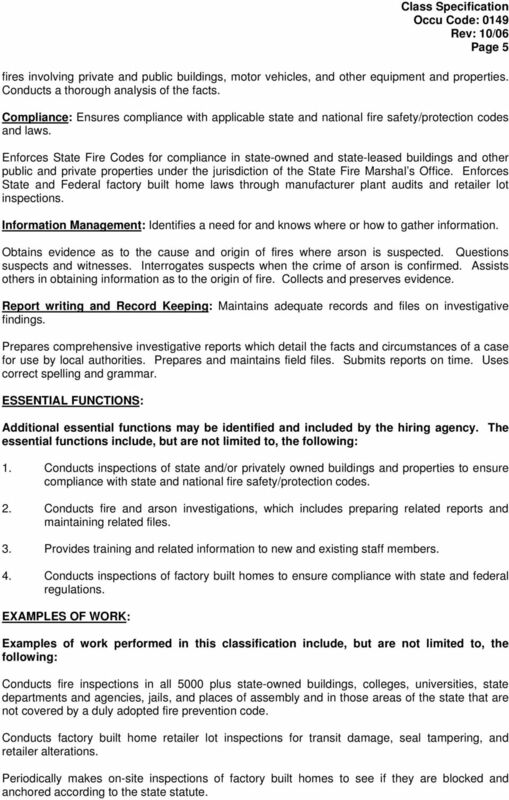 EXAMPLES OF WORK: Examples of work performed in this classification include, but are not limited to, the following: Conducts fire inspections in all 5000 plus state-owned buildings, colleges, universities, state departments and agencies, jails, and places of assembly and in those areas of the state that are not covered by a duly adopted fire prevention code. Conducts factory built home retailer lot inspections for transit damage, seal tampering, and retailer alterations. Periodically makes on-site inspections of factory built homes to see if they are blocked and anchored according to the state statute. 6 Page 6 Investigates fire scenes where the cause of the fire is arson, suspicious, undetermined, or a death resulted from the fire. Collects and preserves evidence; sends samples collected to laboratory for analysis. Interviews witnesses and interrogates suspects when the crime of arson is confirmed. Secures background information on suspects from financial institutions, employers, neighbors, and criminal records. Testifies in criminal or civil court as an expert witness in the field of fire investigation. Prepares comprehensive investigative reports which detail the facts and circumstances of a case for use by local authorities in the prosecution of arson suspects as outlined by state statute. Investigates factory built home consumer complaints and reports findings to supervisor. Inspects fire extinguishing and protection equipment. Performs related or similar duties as required or assigned. INTERVIEW REQUIREMENTS: Any candidate who is called to an agency for an interview must notify the interviewing agency in writing of any reasonable accommodation needed prior to the date of the interview.